In Jenkins versions previous to 1.565.1 the parameters of a build parameterized with run parameters the rebuild displayed in human readable form, as the name set for the build. This is essential for usability as the run parameter list displays human readable build names. However, starting with Jenkins v.1.565.1 when build run parameters are displayed as build numbers and it is difficult for the users to decipher what run parameters they used. 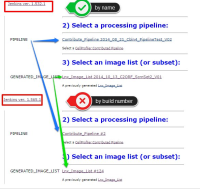 Compare the current and previous version screenshots each containing two run type parameters.